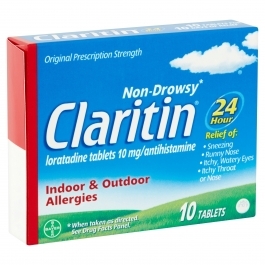 Claritin 24-Hour Non-Drowsy Allergy Relief is ideal for anyone who suffers from indoor or outdoor allergies. It gives powerful relief from symptoms such as runny nose, sneezing, itchy and watery eyes and more. Clinically tested, this medicine can help keep you as alert and focused as someone without allergies. These 10mg loratadine tablets can be taken by adults and children 6 years and older. Directions. Adults and children 6 years and over: 1 tablet daily; not more than 1 tablet in 24 hours. Children under 6 years of age: ask a doctor. Consumers with liver or kidney disease: ask a doctor Instructions: Directionsadults and children 6 years and over take 1 tablet daily; not more than 1 tablet in 24 hourschildren under 6 years of age ask a doctorconsumers with liver or kidney disease ask a doctor. Inactive Ingredients: Corn Starch, Lactose Monohydrate, Magnesium Stearate Active Ingredients: Loratadine.